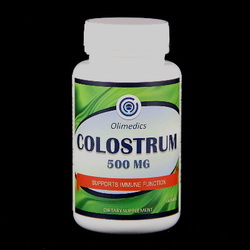 Colostrum provides natural immune support. Studies suggested taking bovine colostrum may reduce infectious diarrhea in children and people with a weakened immune system, including those with HIV/AIDS and bone marrow transplant recipients. Take 1 capsule orally 1 to 3 times daily preferably with meals or as directed by a health care professional. CONTAINS MILK (COLOSTRUM). This product is manufactured and packaged in a facility which may also process milk, soy, wheat, egg, peanuts, tree nuts, fish and crustacean shellfish. KEEP OUT OF THE REACH OF CHILDREN. DO NOT USE IF SAFETY SEAL IS DAMAGED OR MISSING. STORE IN A COOL, DRY PLACE.